The American Society of Interior Designers (ASID) has announced a new event geared towards today’s industry thought leaders. Platform: A Retreat for Design Visionaries will cater to principals, partners, and owners, offering a broad spectrum of activities specifically built for high-level design experts. Platform looks beyond the design world to inspire its guests — speakers range come from the worlds of tech, business, and more. By taking guests out of their comfort zone and exposing them to a boundary-pushing, thought-provoking experience, Platform sparks new conversation designed to propel the industry forward. The programming looks to the world at large for its base. As opposed to being restricted to solely the design world, Platform explores what design leaders can learn from other industries and apply to their own practice. Tech, startups, business and marketing leaders, and more will lead engaging discussions about their industries and the global application of design. Platform foregoes the usual speaker layout and invests in programming that is an ongoing dialogue between presenter and participant. Speakers include: Wired Editor-in-Chief Nicholas Thompson, Tito’s Handmade Vodka Chief Joyologist and Director of Philanthropy Amy Lukken, Forbes School of Business and Technology Professor Chitra Anand, Physician and Global Social Entrepreneur Dr. Shimi Kang, and New Cities Foundation Senior Fellow Greg Lindsay. Partners for Platform include: Benjamin Moore, Cosentino, and Signature Kitchen Suite. Platform guests will also spark inspiration and ideas with one another. To become a Platform guest, designers will first have to apply and share a bit about themselves and their practice. Onsite, Platform offers group wellness activities like yoga, daily challenges, and group meals to encourage networking that keeps the conversation flowing. Platform is also open to the entire design community to fully encompass the future of the industry. 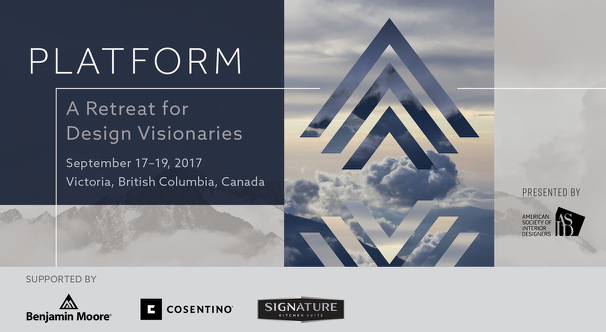 The inaugural edition of Platform will take place at the Fairmont Empress resort in Vancouver, British Columbia, September 17-19 2017. To apply or learn more, visit https://asid.org/platform.